Zoom on video player. That is the most highly requested feature you and other users want in the next Turn Off the Lights Browser extension version. As we said before, that Turn Off the Lights is the ultimate video tool, and that extends this promise. You can find this new feature in the Turn Off the Lights Browser extension v3.4.3.0 and higher. Also, we have improved few other things such as the compatibility with YouTube new layout and the action command to automatically dims the web page. 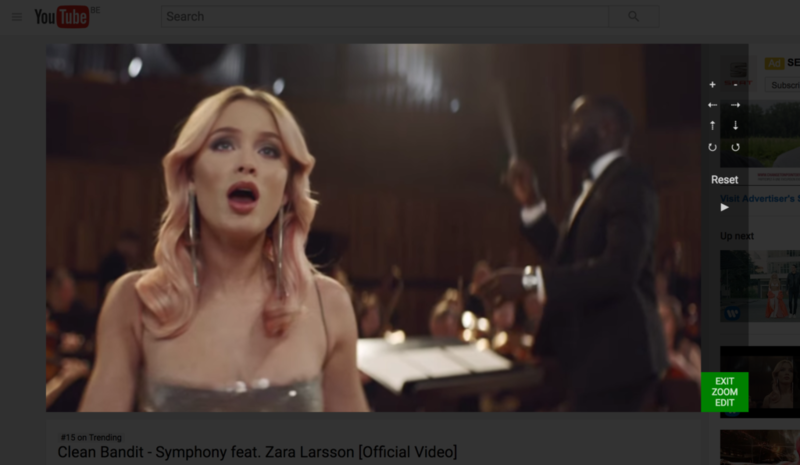 How to zoom in a video player? To activate this feature enable the checkbox “Zoom on Video” feature in the Turn Off the Lights Options page > Advanced Options > Video Toolbar. Then when you open a website with an HTML5 video player inside, move your mouse inside this video content. You see rights that it adds right a new panel. With one click you can zoom in, zoom out, rotate to left, rotate to right, move to the left, move to the right of the video content. And also on this panel there is a reset button to get everything back to the default scale and position. While you are in the Video Zoom Edit mode, the video player controls are automatically hidden. However, we you can pause/play the video also in this zoom mode with this play/pause extra button. And when you are done, click on the green button to exit this zoom mode. One of the first feature in this extension got also an update, now you can choose when to dims the page. This on the play, pause or stop button from that HTML5 video player. Thank you all for your feedback and reviews. However, we still need your support. If you like this feature, please don’t forget to share this news with your friends. Rate this extension to 5 stars. And if you can make a donation we appreciate it very much.